Montreal, Quebec, Canada, December 28, 2017 – MONARQUES GOLD CORPORATION (“Monarques” or the “Corporation”) (TSX.V:MQR) (OTCMKTS:MRQRF) (FRANKFURT:MR7)is pleased to report the results of the updated mineral resource and reserve estimates for its wholly-owned Beaufor mine. The mineral resource and reserve estimates were prepared by InnovExplo inc., in collaboration with Beaufor mine personnel and the Corporation in accordance with NI 43-101. Unless otherwise indicated, all amounts in this press release are presented in Canadian dollars. The Beaufor mine is located approximately 20 km northeast of Val-d'Or, in the province of Quebec. The mine has been in operation since 1930. The ore from the Beaufor mine is processed at the Camflo mill, which has a 1,600 tonne-per-day milling capacity. The mill is operated by Usine Camflo inc., also wholly-owned by Monarques. 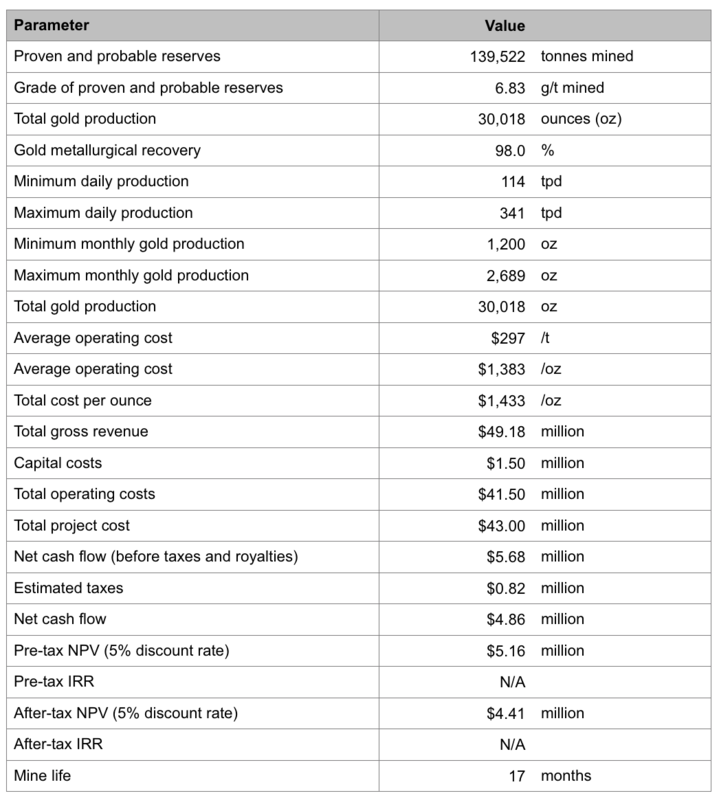 Based on a gold price of $1,638/oz, reflecting a gold price of US $1,280/oz and an exchange rate of 1.28 CAD/1 USD, the study demonstrates that the Beaufor mine could generate an after-tax net present value of $4.41 million at a 5% discount rate with a total production of 30,018 ounces over the mine life. Operating costs would total $41.5 million and the total project cost would be $43.0 million. The average production cost would be $1,433/oz. The independent and qualified person for the mineral reserve estimate, as defined by NI 43-101 is Laurent Roy, Eng. (OIQ No. 109779), of InnovExplo Inc. The effective date of the estimate is September 30, 2017. The economic viability of the mineral reserve is proven. Results are presented including dilution. Dilution varies from 10% to 15% for the long-hole stopes based on the position of the dyke, and is 0% for the room-and-pillar stopes as the stope width is less than 2.40m. Results are presented including mining recovery rates. Mining recovery varies from 85% to 90% for long-hole stopes based on the position of the dyke and is 90% for room-and-pillar stopes. The metallurgical gold recovery at the Camflo mill is 98%. The mineral reserve was compiled using cut-off grades of 3.95 g/t Au (long-hole) to 4.66 g/t Au (room-and-pillar). Cut-off grades must be re-evaluated in light of prevailing market conditions (gold price, exchange rate and mining cost). A constant specific gravity value of 2.75 t/m3 was used. A minimum true thickness of 2.40 m was applied. Ounce (troy) = metric tons x grade / 31.1035. Calculations used metric units (metres, tonnes, and g/t). The mineral reserve was estimated using a long-term gold price of CAD 1,638.40 per ounce (metal price of USD 1,280 per ounce and an exchange rate 1.28 CAD/1 USD). Tonnage and ounces estimates were rounded to the nearest hundred. Any discrepancies in the totals are due to rounding effects; rounding followed the recommendations in Form 43-101F1. The mineral reserve estimate is compliant with CIM standards and guidelines. InnovExplo is not aware of any known environmental, permitting, legal, title-related, taxation, socio-political, marketing, or other relevant issue that could materially affect the mineral reserve estimate. The independent and qualified person (“QP”) for the Mineral Resource Estimate as required by NI 43101 is Carl Pelletier, P.Geo. (OGQ 384), employee of InnovExplo Inc. The effective date of the estimate is September 30, 2017. Mineral reserves have been subtracted from mineral resources. Results are presented in-situ and undiluted. The reported mineral resource is considered by the QP to have reasonable prospects for underground economic extraction. The estimate includes 63 mineralized zones in the Beaufor mine. Mineral Resources are estimated at variable cut-off grades ranging from 3.95 g/t Au (long-hole) to 4.66 g/t Au (room-and-pillar). Cut-off grades must be re-evaluated in light of prevailing market conditions (gold price, exchange rate and mining cost). A specific gravity value of 2.75 t/m3 was used. A minimum true vein width of 2.40 m was used. Capping of high-grade values was done at 68.5 g/t Au for zones 8, B, M, M1 and Q, while all other zones were capped at 34.25 g/t Au and drill hole intersections were capped at 16.5 g/t over 2.40 m. Capping was done on raw assays. The estimation method was polygonal on cross section. Polygons for measured resources extend 8 m above and below development and up to 10 m laterally. Polygons for indicated resources do not extend more than 20 m from drill hole intercepts, along dip and along strike. Polygons for inferred resources do not extend more than 40 m from drill hole intercepts, along dip and along strike; they are generated where the drill spacing generally ranges from 20 m to 40 m and/or in areas of isolated drill holes where mineralization is interpreted to be the extension of known mineralized zones. Mineral Resources are estimated using a long-term gold price of CAD 1,638.40 per ounce (metal price of USD 1,280 per ounce and an exchange rate of 1.28 CAD/1 USD). Tonnage and ounce estimates were rounded to the nearest hundred. Any discrepancies in the totals are due to rounding effects; rounding followed the recommendations in Form 43-101F1. CIM definitions and guidelines were followed in estimating mineral resources. A technical report on the Beaufor mine’s mineral resource and reserve estimates, as presented above, will be filed today, Thursday, December 28, 2017, on SEDAR following the publication of this press release. The technical content of this press release was reviewed and approved by Mr. Marc-André Lavergne, Eng., a qualified person according to NI 43-101. The mineral resource estimate of the Beaufor mine was prepared under the supervision of Mr. Carl Pelletier, B.Sc. Geo., an employee of InnovExplo Inc. Mr. Pelletier is an independent qualified person according to NI 43-101 and has reviewed and approved the technical content of this release, which corresponds to the mineral resource estimate of the technical report. The mineral reserve estimate of the Beaufor mine was prepared by Mr. Laurent Roy, Eng., an employee of InnovExplo Inc. Mr. Roy is an independent qualified person according to NI 43-101 and has reviewed and approved the technical content of this release, which corresponds to the mineral reserve estimate of the technical report. Monarques Gold Corp (TSX-V:MQR) is an emerging gold producer focused on pursuing growth through its large portfolio of high-quality projects in the Abitibi mining camp in Quebec, Canada. The Corporation currently owns close to 300 km² of gold properties (see map), including the Beaufor mine, the Croinor Gold (see video), Wasamac, McKenzie Break and Swanson advanced projects, and the Camflo and Beacon mills, as well as six promising exploration projects. It also offers custom milling services out of its 1,600 tonne-per-day Camflo mill. Monarques enjoys a strong financial position and has more than 150 skilled employees who oversee its operating, development and exploration activities.